It seemed like such a good idea at the time. Jack Haberman, the driving force behind the Gateway Redevelopment Group, a nonprofit organization that works in Davenport's Gold Coast neighborhood, was looking for vintage barn siding to use on a storage shed the group was building. He spotted an ad in the Quad-City Times for a barn on Davenport's 53rd Street east of Utica Ridge Road and closed the deal for $2,500. 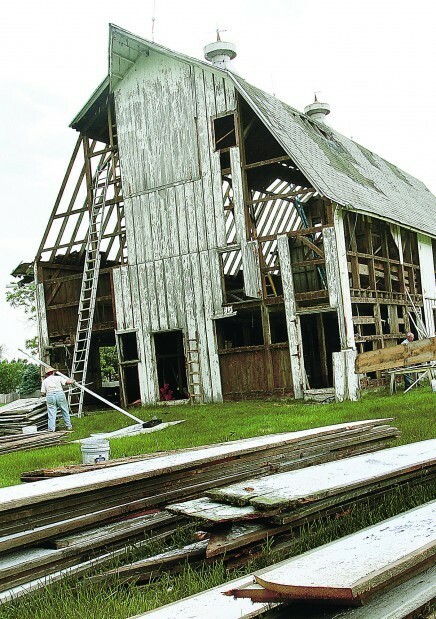 The idea was that volunteers from the Gateway group would take down the circa-1926 barn, salvaging the boards they needed for their own use and selling the rest. "I don't know what I was thinking," Haberman says now. "It was so much more work than I thought it would be. I'm asking the board (of the Gateway group), the next time I come up with any bright ideas, please remind me how we spent our summer." Work began June 4 and concluded Aug. 27. It took 15 volunteers giving 348 hours over 12 mostly weekend days of generally oppressive heat and humidity to tear down the barn. Going into the project, Haberman visualized volunteers stripping the structure, making it unstable and pulling it down. "The barn was much stronger than we thought," he says. He lost at least three nights' sleep trying to think of alternatives once it became apparent his original vision was misguided. "David saved us," Haberman said, referring to Gold Coast resident and Guatemala native David Leiva, who combined his black belt in Taekwondo, previous roofing experience and an absolute fearlessness of heights to literally kick down parts of the structure that refused to budge any other way. Taekwondo is a Korean martial art using the feet and hands to strike. "He has unbelievable balance and a real can-do attitude," Haberman said of Leiva. "He basically beat the roof into submission. It was just awesome. The pictures do not do him justice." 1. It acquired wood for the storage building, both for exterior siding and interior shelves. The purpose of the 20-by-36-foot building is to house overflow materials from the group's Architectural Rescue Shop at 8th and Gaines streets. The use of salvage lumber to construct the building was part of the "match" that Gateway put up in obtaining a $14,835 forgivable loan from the Iowa Department of Natural Resources that covered most of its cost. 2. It has raised $874 so far through the sale of salvaged items, including $300 for one of the collectible cupolas, and Haberman figures he can sell the second for at least that much. He didn't get as much for the wood as he might have, but when would-be buyers showed up offering 20 cents per board foot on the spot, Haberman took them up on the deal rather than trying to store the lumber in hopes of getting a better price later. 3. And then there's the intrinsic good accomplished by all of the recycling. Instead of being torn down and landfilled, most of wood from the barn will be repurposed. Something shy of a Dumpster load of shingles was taken to the Scott County Landfill, where it will be ground up and sold to hot-mix asphalt plants for use as binder in the manufacture of paving material. More than nine dump-truck loads of rotten or unusable wood was hauled to the River Cities Business Park (formerly the Caterpillar plant near Mount Joy) to be burned and generate steam for energy needs, said Kathy Morris, the director of the Waste Commission of Scott County. About 545 pounds of scrap metal was recycled, and only one pickup load of debris went to the landfill. "That's pretty significant," Haberman said. "I'll never do it again, but it was worthwhile to have done it," he said of the barn razing. Copyright 2011 The Quad-City Times. All rights reserved. This material may not be published, broadcast, rewritten or redistributed.